Sorry for a later update than I would have hoped. Cable/internet outage due to storms and daddy duty called! 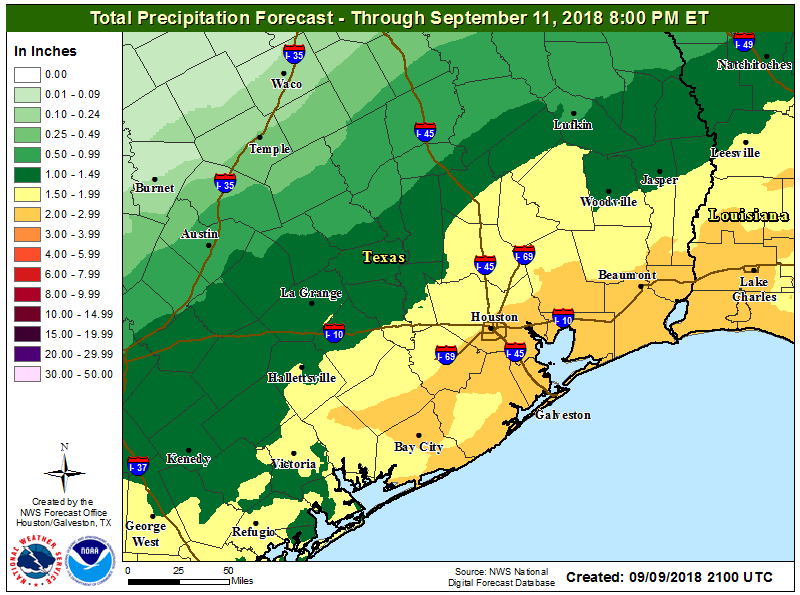 Lots of rain in and around the Houston area today, so we want to provide you a quick refresh on what’s going on with this rain, the tropics, and what to expect to start your week. Radar as of this evening shows rain winding down across the area. Total rainfall over the last two days has been variable, with some places seeing minimal amounts and others seeing 2-3″ or even a little more. Expect a mostly quiet night tonight. But, as we go into tomorrow, a number of things may come together to produce another round of heavy rainfall in the area. Eric will have more on the timing and the where tomorrow morning, but I would have the umbrella by the door tonight at the ready before you head out for work or school. Look for more showers and thunderstorms in the area Monday night or Tuesday. It’s tough at this timescale to narrow down specifics, but suffice to say, locally heavy rainfall will be possible. A Flood Watch isn’t posted for the area, but depending on how we do tomorrow, we may need one Tuesday. Street flooding is the main concern with this event. How much rain? On average, we expect most folks will see another 1-3″ on top of what’s fallen. Since “average” is just a combination of extremes, that means some folks may see less than an inch and others may see four or five inches of rainfall. Again, we don’t expect widespread problems and street flooding is the biggest concern right now. The rest of the forecast this week is contingent on the tropics. This afternoon, the National Hurricane Center (NHC) outlined the disturbance we’ve been telling you about since last week. It’s currently in the Caribbean, but it will track toward the Yucatan and Gulf over the next two to three days. 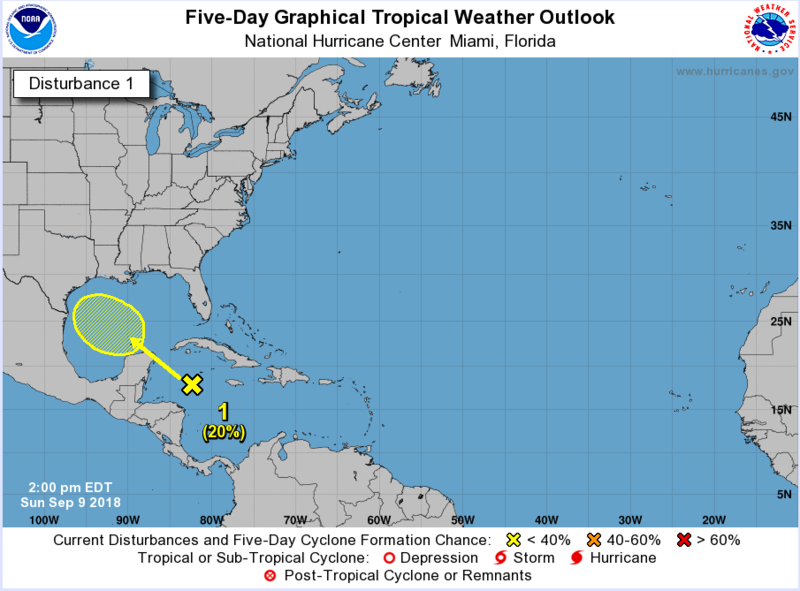 The NHC outlook today says that this disturbance has about a 20 percent chance of developing into a depression or storm over the next three to five days. No development is expected before Tuesday. On satellite, the system is poorly organized. It has a lot of storms, but there’s no circulation center, as it battles 20-40 kts. of wind shear. This has a long way to go before becoming a serious candidate to develop. Once it gets to the Gulf on Tuesday or Wednesday, it may have that opportunity. Wind shear will relax and a generally more favorable environment may develop for it to organize. While the NHC is showing “only” a 20% risk of organization this week, conceivably, I think that number will go higher in the next couple days. That said, development, while plausible, may have a ceiling. In other words, don’t expect rapid organization or development from this disturbance. Odds of a hurricane would be pretty, pretty low at this point. It’s worth noting that none of the operational models show this developing beyond maybe a strong tropical wave or depression. The track is too soon to figure out, especially considering the disturbance is an open tropical wave without a circulation center, but the odds probably favor a pathway into South Texas. Impacts for Houston at this point look like primarily an enhanced chance of showers and storms Thursday and Friday, possibly into Saturday. Given the rains this week, some flash flooding could become an issue in Texas again Thursday through Saturday. Stay tuned. Where, when, and what will be determined as the week progresses. It’s far too soon to answer any specific questions regarding this system. Anyone throwing out intensities or rain amounts would be purely speculating at this time. If this system somehow develops into a storm, it would acquire the name of Joyce. Bottom line: We have more questions than answers on this system right now, so you’ll want to check back with us through the week for the latest. You can be sure we will let you know the latest when we have an update. Elsewhere, Isaac and Helene formed this weekend. Helene is already a hurricane, but is ticketed to go out to sea. 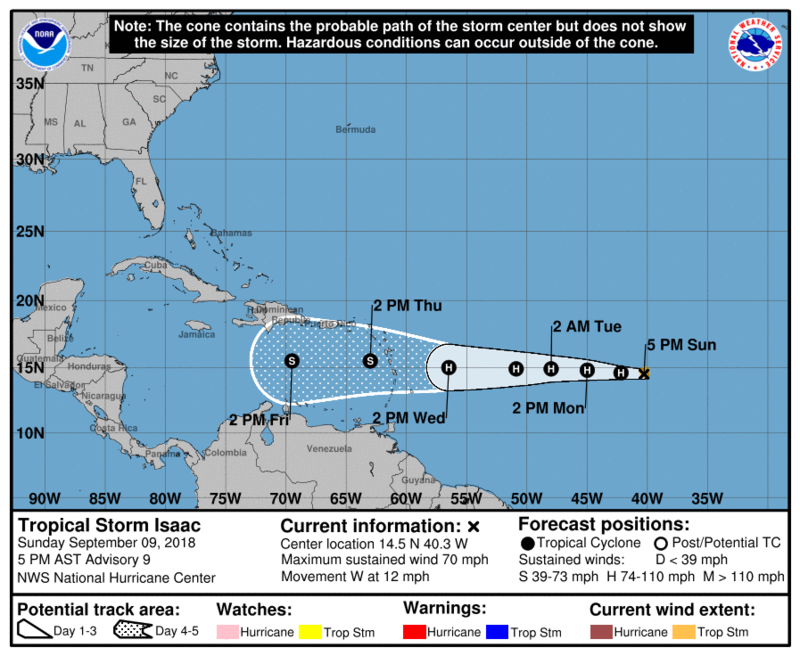 Isaac will head toward the Lesser Antilles and likely become a hurricane overnight.Once in the islands, it will begin to weaken. Isaac is likely to battle a lot of wind shear and perhaps some dry air in that area. It’s not a serious concern for Houston, but it’s something to just keep track of in the days ahead. As of now, the majority of modeling either kills it off completely or takes it into Central America. Then, there’s Florence. Florence will begin the process of rapidly intensifying tonight. It is back to hurricane strength this evening and should become a category four storm as it heads toward the Southeast U.S. coast later this week. 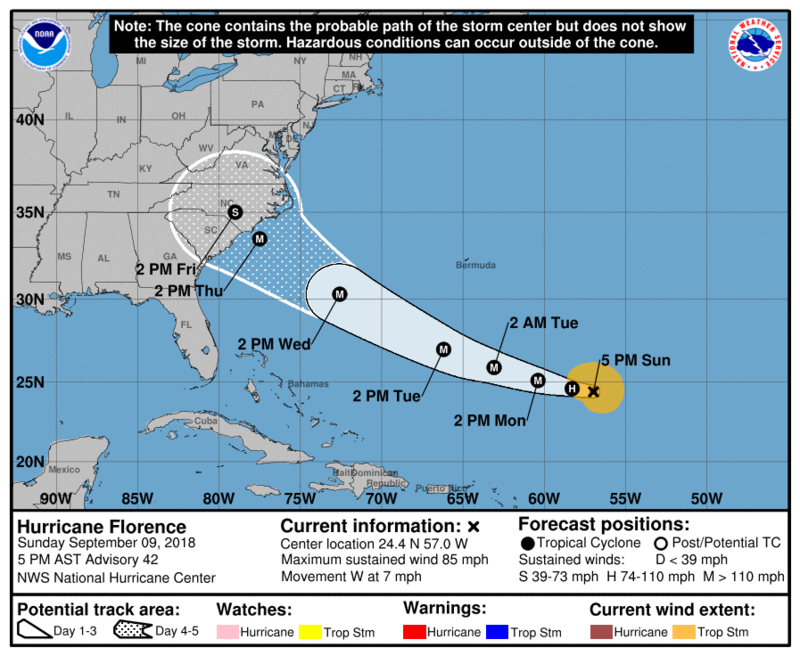 Florence is expected to make landfall as a major hurricane (its intensity will likely fluctuate considerably at times this week) sometime around Friday, probably in the Carolinas, though there’s still some uncertainty on exactly where it comes ashore. As if the hurricane aspect of Florence won’t be bad enough, as we’ve seen so many times in recent years, the flooding from interior rainfall may be equally as alarming. 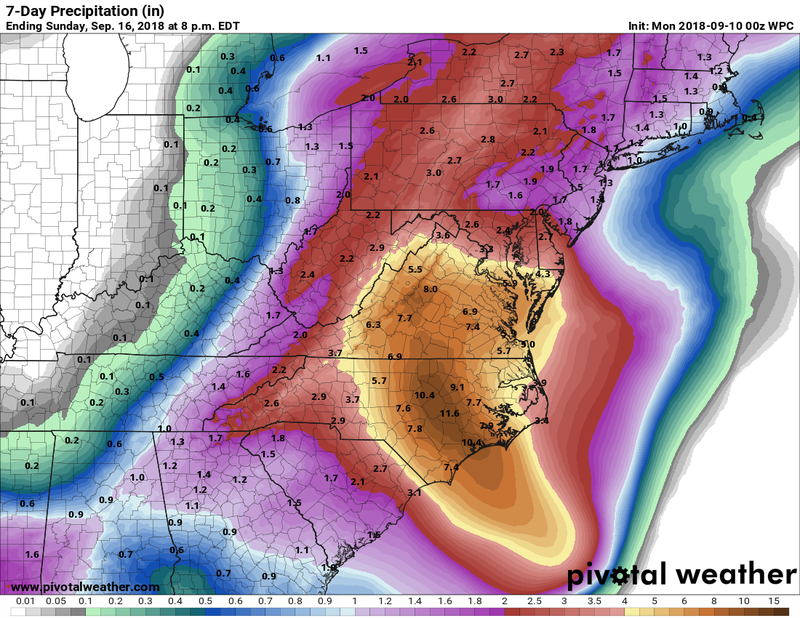 The current NWS 7 day rainfall forecast shows six to twelve inches of rain in parts of North Carolina and Virginia. 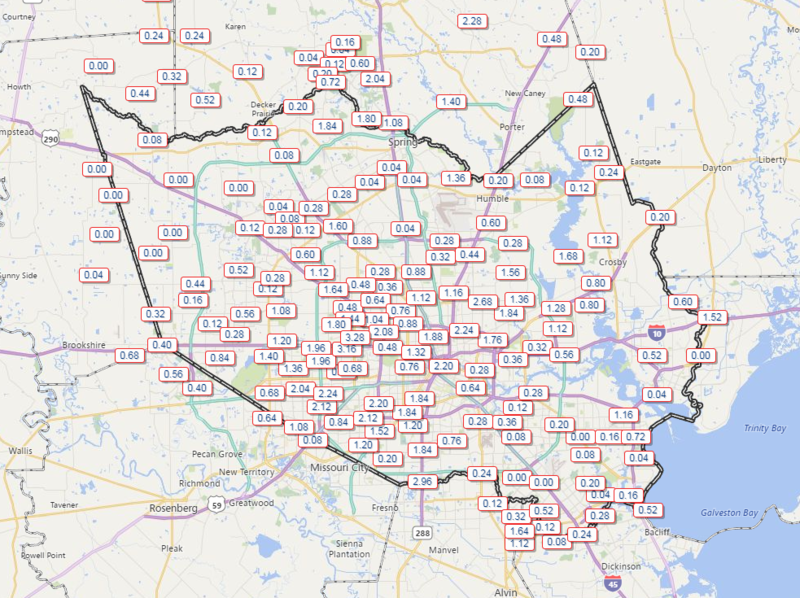 It can be safely assumed that there will be pockets of 15-25 inches of rainfall somewhere in these areas. It’s too soon to pinpoint exactly where. As we saw with Harvey, modeling often pinpointed Victoria as the rainfall bullseye. We know what ultimately happened. Florence is likely to stall over North Carolina or Virginia, allowing for three or four days of tropical rains in places that have seen 125-150% of normal rainfall since June. This is a recipe for some serious flooding, and I am very concerned about what Florence’s aftermath looks like in some parts of the interior Mid-Atlantic. Hopefully the worst rains somehow stay offshore. But unfortunately, modeling is not in favor of that scenario. We’ll keep you updated. Eric takes over in the AM! Have a good evening. Lots of information, thanks for taking your Sunday time to spell it all out. Just to ask for clarity sake- is the disturbance that is headed over the Yucatan 92L or 93L? Or is this storm something different? And if it isn’t 92L/93L have those become named or have we lost interest in them or are they still tracking along but further out? Sorry if this is stated above- I didn’t catch that so wanted to ask. 92L and 93L became Isaac and Helene. Don’t worry Matt – Daddy duty is the most important duty you have now. Thanks, Matt! 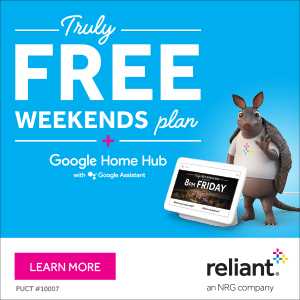 My family and I are recent transplants to Charlotte NC (from Houston), and Im so glad to see that your reporting on Florence! While the storm itself could be very ugly, its nice to know that I can still (sort of) rely on you and Eric for my weather reports! Please (please!!!) keep providing updates for me! Also following from Northern Virginia — just moved from Houston and went through Harvey (without house flooding though!) Thanks, Matt, for the info! The NHC has already upped the “disturbance’s” risk to 30%. Leaving Thursday on cruise out of Galveston to Cozumel on Saturday then back to Galveston. What kind of weather we looking at, my first cruise go figure. I was on that same cruise last year. We got to Cozumel a day after Harvey and it was fine. Unfortunately we could not come home for an additional 6 days due to the port of Galveston being closed. We made an extra two stops in New Orleans to resupply. On the plus side, the cruise dock in Nola is about a block from Canal St and the rest of the Quarter. I recommend Muriel’s in Jackson Square. Thank you Matt for your thorough update! Florence looks like a nasty hurricane and I hope everyone in that area is prepared! Moved to NC coincidentally Harvey weekend a year ago. Have missed Space City weather terribly. Would you believe we’re moving from apartment to new house this weekend in Greensboro, NC with Florence coming ?! I’m reading you from NC for no hype Florence forecasts. Thank you.